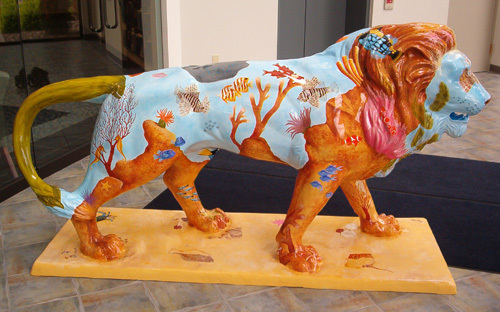 For the “Pride of Oshkosh” exhibition, local businesses paid to sponsor a fiberglass lion sculpture and selected an artist’s design from a portfolio of submitted entries. In “Ocean’s Pride,” the imposing and magnificent lionfish, resplendent in spiky fins, are masters of an ocean kingdom. I painted the eight foot long lion with acrylic paints.